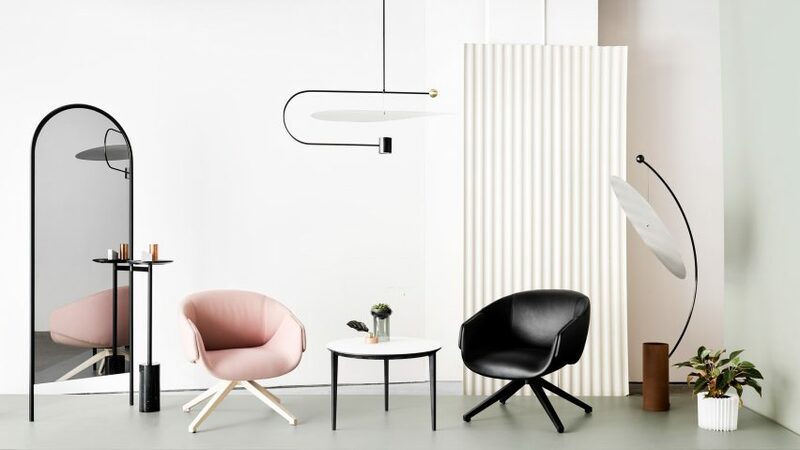 Products by Brooklyn-based Ladies & Gentlemen Studio are on display alongside furniture by new Australian design brand SP01 at a pastel-coloured installation in New York. The Over/Under exhibition marks SP01's US debut, and L&G Studio's first interiors project. The two were brought together by Modern Principle, which represents both businesses. 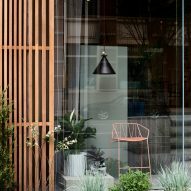 L&G Studio was responsible for designing the space in New York's Soho, which is intended to be "part showroom, part stage set, and part public space". "With this project, we've expanded our creative vision beyond individual objects and into the entire experience," said L&G Studio co-founder Jean Lee. "Over/Under showcases a convergence of the two brands as complementary opposites — in many ways related and in many ways unique." Indoor and outdoor furniture by SP01 is on display against colourful paper backdrops that roll down from the ceiling. These match low platforms on the floor. White paper strips also create curtain partitions that divide the space. 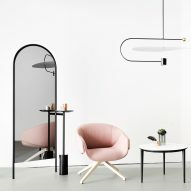 These small styled vignettes are interspersed with new products by L&G Studio, including a series of lights named Float. 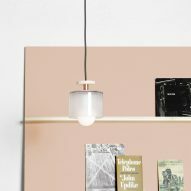 The lighting's blackened brass frames suspend extremely thin aluminium disks, which act as reflectors for the LEDs. Pendant and floor versions are available. "Float implores combinations of the least, most essential elements working in concert to intimately define space with light and form," said the studio. "All forms exist to support and serve the other to direct a soft glows and shadows into its surroundings." Some of the studio's earlier lighting designs also form part of the exhibition, like the Shape Up collection for Roll & Hill, comprising strings of different-shaped pendants, and the Equalizer models with blown-glass spheres. Among the furniture by SP01 on show is the Chee collection of outdoor chairs, and the fully upholstered Max sofas. 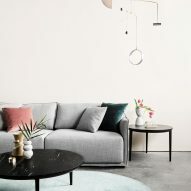 Simple dining, coffee and outdoor tables with colourful tops are presented in the L&G Studio-styled setting, which also includes patterned rugs by Italian company CC-Tapis. 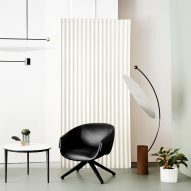 "We looked to L&G Studio to design an experience beyond the traditional showroom – a destination where guests can relax into our pieces, which are designed with urban life in mind," said SP01 head of design and product development Matt Lorrain. 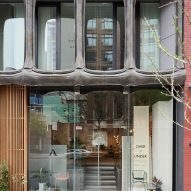 Over/Under is open until 31 May 2017 on the ground floor of the Xoco 325 condominium building, 325 West Broadway, New York. The exhibition coincides with the citywide NYCxDesign festival, which runs until 24 May 2017, as does the Designing Women showcase of work exclusively by female designers.